On behalf of the Pennsylvania Chiropractic Association’s Board of Directors, district leaders, committees, members, and staff, WELCOME to PCA! Founded in the early 1930s and having weathered a variety of organizational transformations over the past 90+ years, PCA remains the largest association representing the interests of ALL Doctors of Chiropractic throughout the Commonwealth of Pennsylvania. To that position of privilege, PCA is totally led BY and FOR Pennsylvania’s Doctors of Chiropractic, with the PCA staff, located in Pennsylvania’s capital city of Harrisburg, serving to implement all directives of the duly-elected PCA President, Executive Committee and Board of Directors. What this means is both simple and direct: PCA’s past is exactly that- the past. Since mid-2010, when a major reformation of PCA was initiated and implemented by a small but passionate group of DCs, all of PCA’s core functions and services- legislative, regulatory, educational, insurance, annual convention, membership benefits, web site, marketing and communications- are led and overseen by PCA member DCs. PCA exists to inform, educate, and advocate on behalf of the Chiropractor and patient. PCA advocates conservative care first as a verified strategy for safe and cost-effective health care for Pennsylvanians. 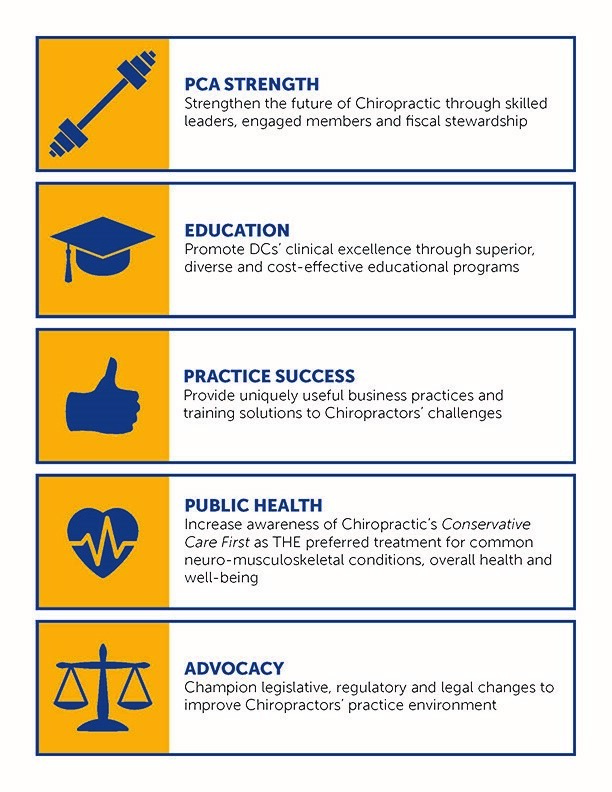 In doing so, PCA enables and empowers Doctors of Chiropractic to successfully treat and educate their patients and to ethically practice their profession to the benefit of patients, communities, and the Chiropractic profession. Transparency is a core value of the Pennsylvania Chiropractic Association and has evolved into a driving force behind all of the PCA’s key initiatives, including financial disclosures and the conduct of PCA business. As a 501(c)(6) non-profit organization, PCA’s members will find the association to be open and responsive to members’ inquiries. Also, PCA’s regularly scheduled Board meetings are open for members to attend and to observe. Of particular importance, especially as our nation and Pennsylvania engage in the transformation of the health care delivery system, is to improve transparency in all aspects of health care. That spirit of integrity is now more important than ever and the PCA continues to advocate for transparency in health care and to foster collaborations and innovations with businesses and political leaders, health plans, and health care providers. Doctors of Chiropractic, both members and non-members, need and deserve access to information that can influence the decisions they make about affiliating with professional associations–PCA included. The Pennsylvania Chiropractic Association has served its members, as well as worked with health care associations, public policy decision-makers, businesses, the media, and community leaders. PCA is dedicated to the Chiropractic profession and led by Chiropractors. We have 9 different committees of practicing Chiropractors working hard for PCA members. Some of these committees ensure numerous quality options for continuing education seminars, answer insurance and legal questions, and work to provide a convention for Pennsylvania DCs and Chiropractic Assistants every year. The Pennsylvania Chiropractic Association is the state’s largest Chiropractic healthcare association. We have 1,000 members–DCs and businesses–across Pennsylvania. Through hard work and tenacity, PCA has gained a reputation for knowledge and commitment in serving our doctors’ needs. With a headquarters office staffed by dedicated professionals, PCA is located within walking distance of the state capitol complex in Harrisburg, Pennsylvania. We pride ourselves on a full-service approach to our membership that is recognized statewide by members and non-members alike. By keeping members informed of the latest professional information and news, we are helping the Chiropractic profession and improving quality of care for patients. If you have any questions, concerns and/or ideas to improve PCA’s service to you, PLEASE feel free to email PCA at your convenience.